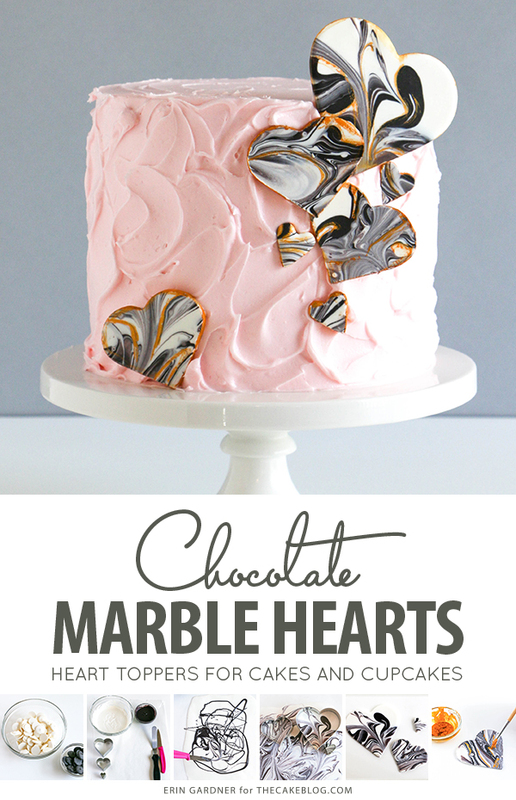 Marble Chocolate Hearts – how to make marbled heart toppers for cakes and cupcakes using chocolate coating and cookie cutters. A new tutorial by our contributor Erin Gardner. 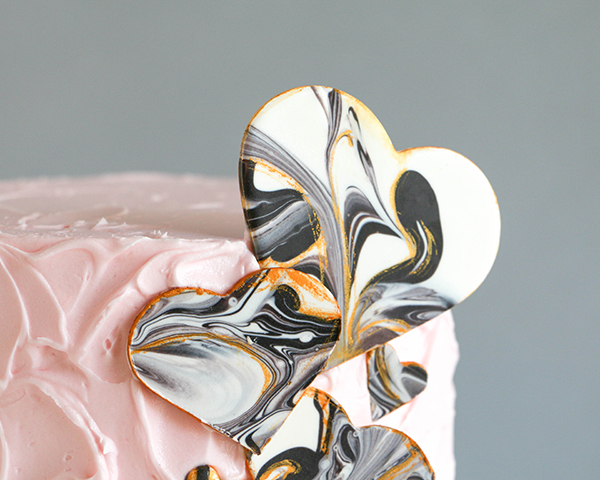 Make simple and chic marbled chocolate hearts to dress up a Valentine’s Day cake, a modern Mother’s day cake, or for any other occasion that calls for cuteness! 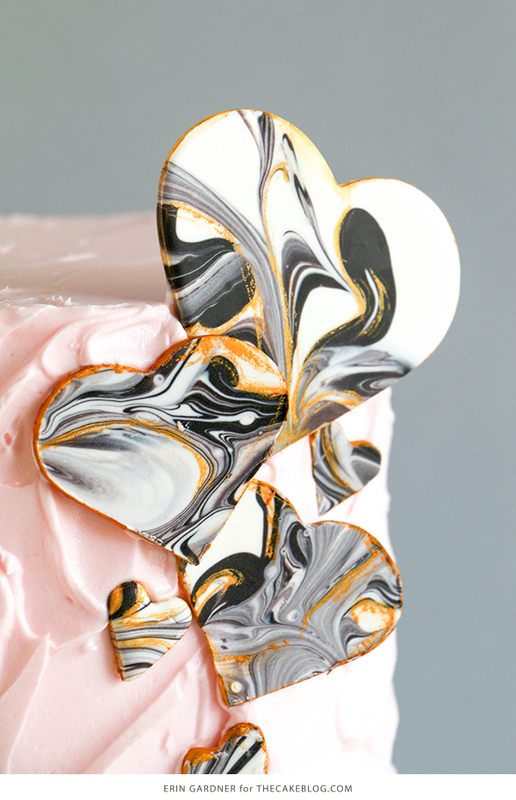 What better way to show someone just how much you *heart* them than to shower them with hearts that are as beautiful as they are delicious. Trends come and go, but chocolate is forever! 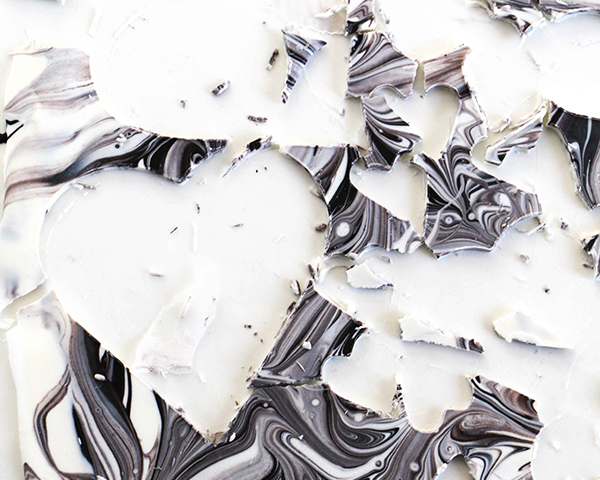 Using coating chocolate speeds up the heart making process. If you’re feeling adventurous, you could use the same technique to make them with tempered chocolate and colored cocoa butters. 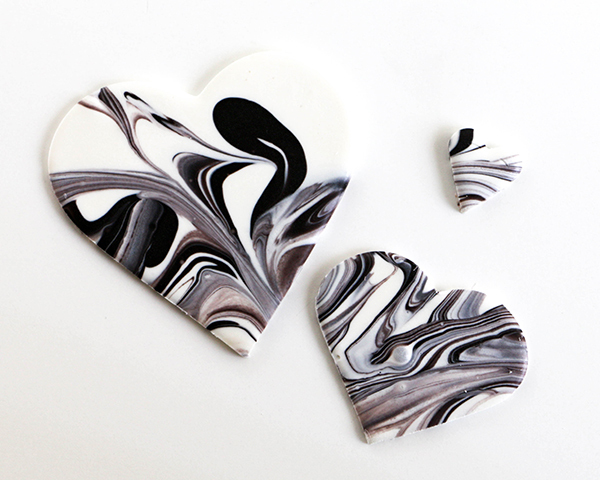 Follow my lead and make marbled hearts in classic black and white, or try other fun color combinations like red and white, shades of pink, or even rainbow! 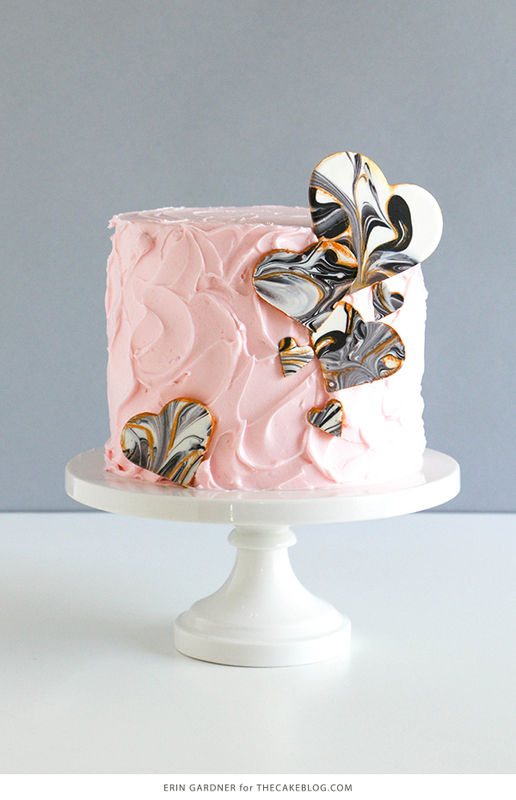 Marbled chocolate hearts look gorgeous cascading down the front of a buttercream iced beauty, but they’d look just as sweet on a sheet cake or as cupcake toppers. 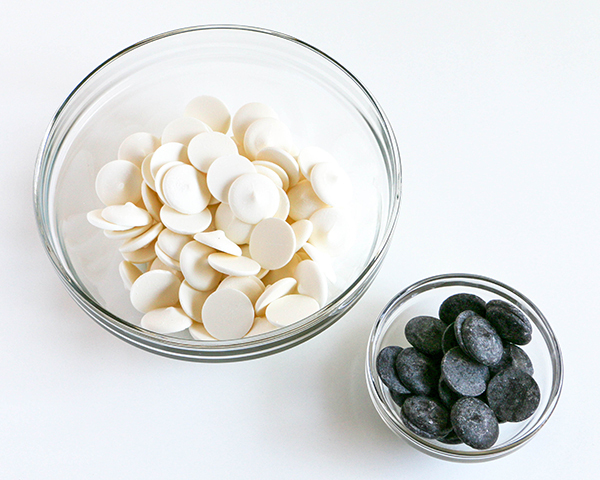 Melt the white and black coating chocolates in separate bowls. Use as much of each color as you like. I used about 3 cups of white coating chocolate to 1/2 cup of black. 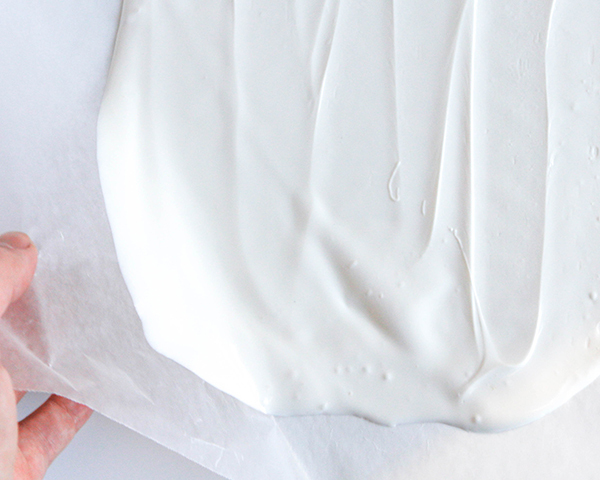 Pour the melted white coating chocolate onto a piece of wax paper. Spread the chocolate evenly across the paper with an offset spatula. 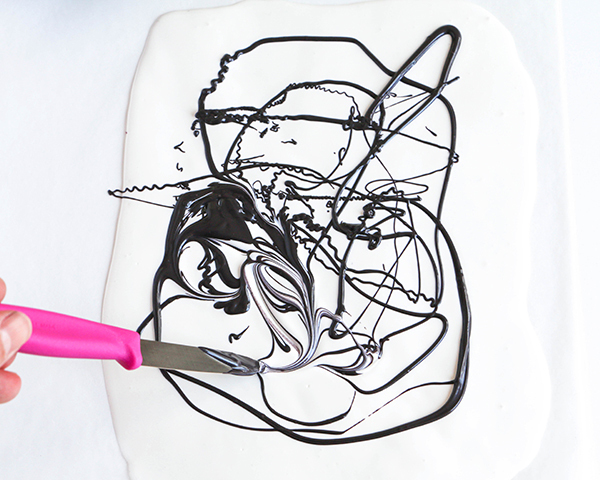 Lift a corner of the paper and wiggle it around to smooth out the lines left behind by the spatula. 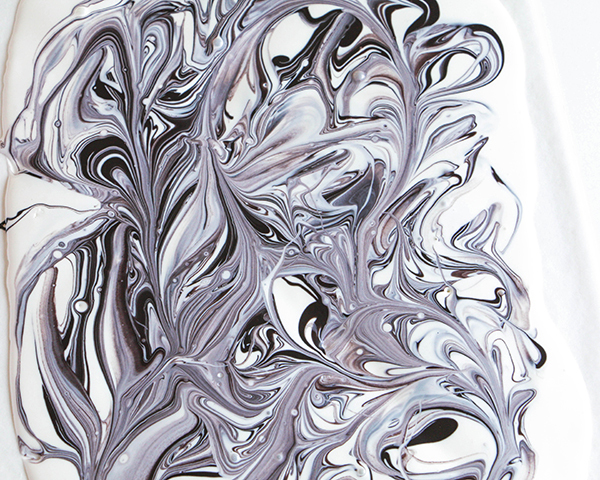 Drizzle the black coating chocolate over the white. 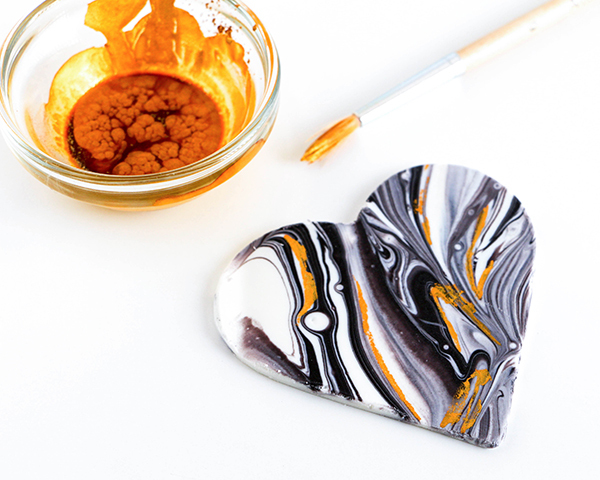 Use the tip of a small knife to swirl the colors together and create a marbled pattern. Lift a corner of the paper and wiggle it again to smooth out the black lines and release any air bubbles in the coating chocolate. 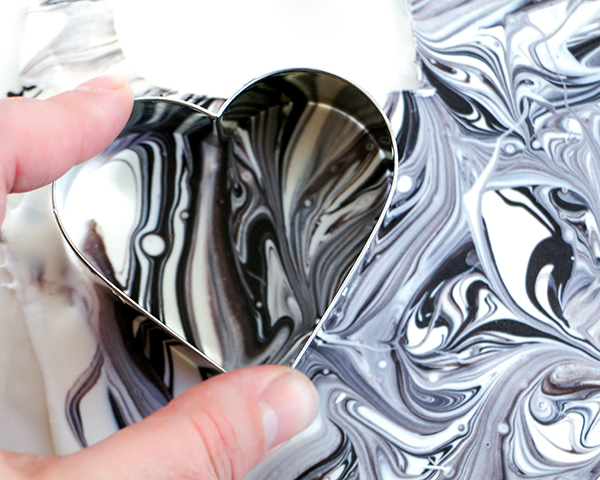 Press your heart cutters into the marbled chocolate and set it aside until the chocolate has hardened, about 10 minutes. 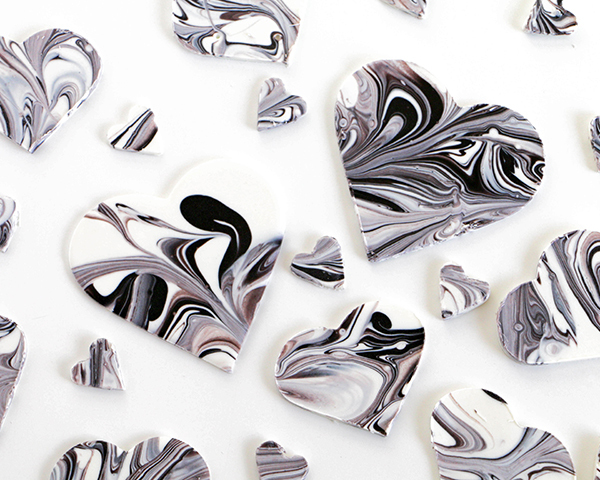 Remove the cutters and peel the chocolate hearts off of the wax paper. 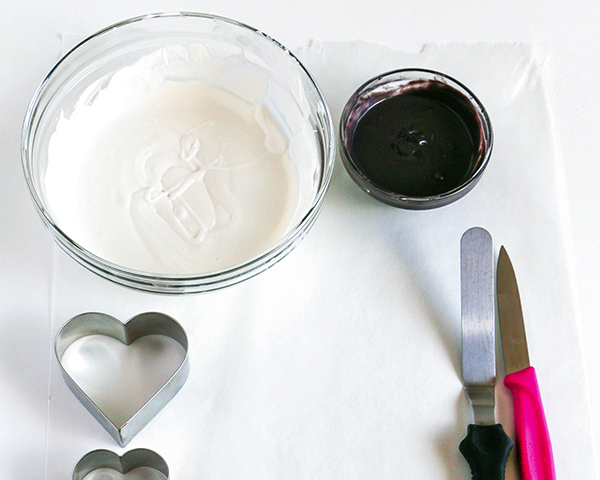 Cut more hearts by pressing the cutters firmly into the room temperature chocolate. If your chocolate has set up very firm, first gently warm the sharp edge of your cutter by dipping it in hot water or setting it on a warm sauce pan for just a few seconds before cutting the chocolate. Combine a few drops of clear alcohol or extract with FDA approved edible gold luster dust in a small bowl. 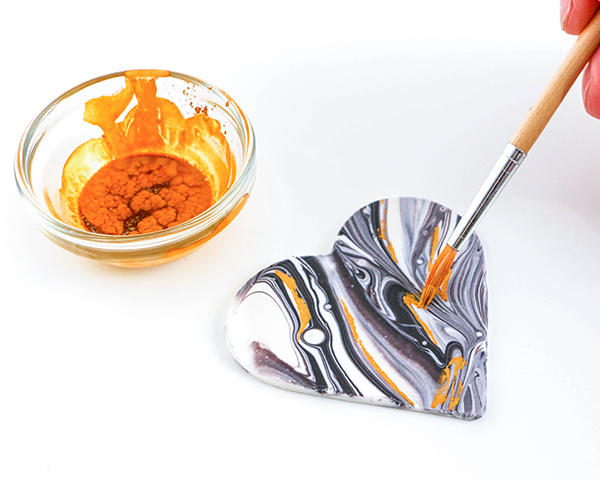 Use a fine tipped paint brush to add gilded lines within the marble pattern and to paint the edges of the hearts gold. Set aside until gold details have dried. 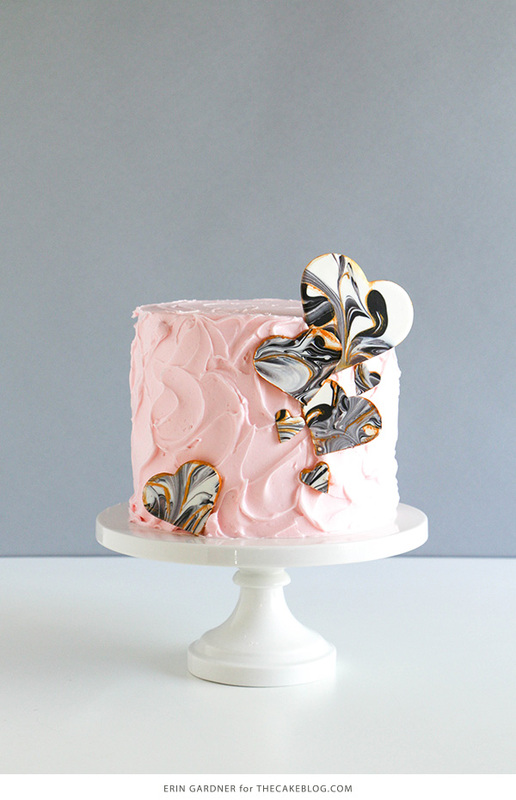 Attach a heart to your finished cake using a dab of buttercream. 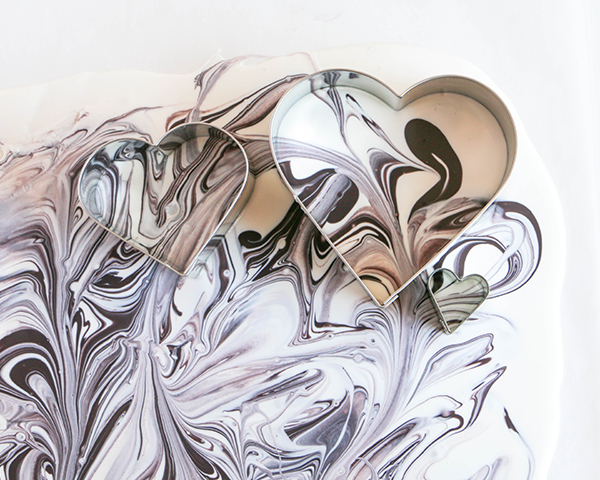 Make the hearts ahead of time and store them layered between wax or parchment paper in an airtight container at room temperature until the coating chocolate’s expiration date.